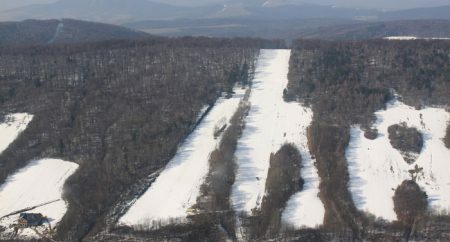 The ski centre is situated in the cadastre of the village of Medvedie. Ski lifts are situated some 300 m past the village towards Šarbov. The centre was started in 1998 in the lovely setting of the Low Beskid nature. The ski lift Tatrapoma P, 400 m long, was in operation at that time. Later the S ski lift, 200 m long, was added for beginners. The centre has earned its reputation as a perfect destination for family skiing trips. This reputation includes a new ski run (the third ski run, Tatra-poma H100, 600 m long and 130 m in height).